Hats for babies knit from cotton threads or suede. They are gentle and soft and very well erased. Not necessary for very young children to use complex knitting yarn and patterns. The cap should be comfortable, lightweight, soft and without seams. This caps is fit for children aged from birth to 1.5 months, no more. Dial on the spokes 17 of the loops provarite rectangular canvas with a length of 32 rows elastic 1:1. This will be the back of the cap. To tie the cap for a newborn without seams, with both sides of the rectangular fabric dial for extra spokes for 16 loops, proverite the front loops of the first row and 17 of the hinge middle and caught the loop with both sides of the door. Start knitting from the right edge of the front loops and every two zabirayte loop on the needle the loop of pulling. You on the spoke should have 24 stitches. Continue knitting the front loops of the middle part 17 of the loops. The upper part of the cap. On the left needle, make a mirrored increase of advance every two loops. Should have 24 stitches on the left needle. Now count all the loops on the needles. Must be 65 loops (24+17+24). 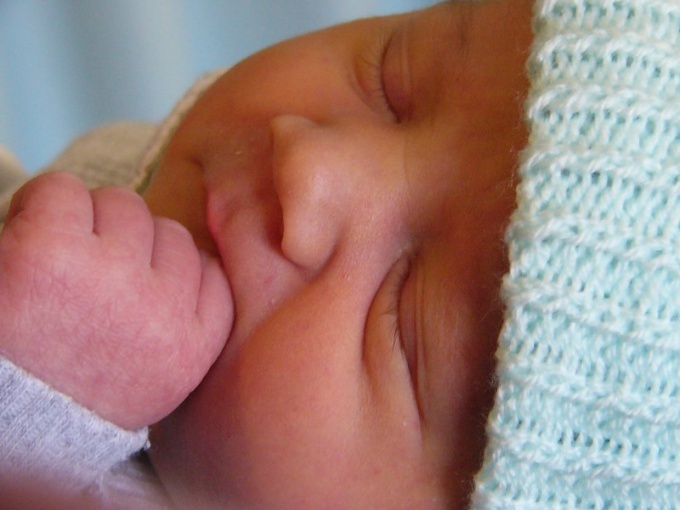 Practical only to bind the cap for a newborn facial surface. But you can use any simple pattern at will. So knit the pattern 32 number directly. Finish knitting elastic 1:1. Provarite so even the 6 series. For decorating hats tie crochet edges of columns without nakida. Weave the lace, insert it into the edge of the cap, knitted elastic. As ornaments can make tassels on the ends of shoelaces. POM-poms to make for babies uncomfortable. Can use narrow ribbon as a drawstring that can be pushed through the lower edge of the beanie and tie it to the bow. Hat you will be able to communicate quickly, in about two hours. If you wish, take threads of different thicknesses, and knitting needles of appropriate size and knit a hat for a baby for a few months, using this description. 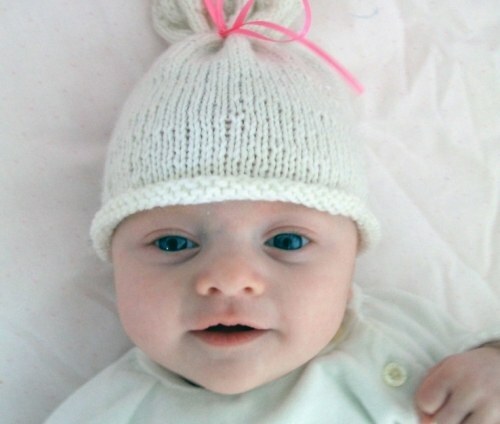 Cap for a newborn is one of the first things that should be in the wardrobe of the child. Even better, if such a cap will be associated with their hands. This thing will give your love and care for the baby. A simple cap under force to bind even the beginner knitter. The main thing to be able to knit air loop, the columns without nakida and with nakida. Fine wool or cotton yarn, hook, scissors. Cap is designed for the circumference of your head, 35-37 cm loops tie a chain length of approximately 30 cm continue Knitting columns with nakida. Link the rectangle with a height of 10-11 cm Thread tear off. Promazyvanie the back of the cap. Fold the resulting rectangle in half. Both sides of the middle measure 4.5 cm and mark these points contrasting thread or with pins. The first row of the rear of provarite columns with nakida. In 2-4 rows on two sides make the addition of one column with nakida. Vymazyvaja additional columns from the base of the far post. 5 a number provarite without additions. The width of the fabric should be 9-10 cm Then every odd row, do subtraction from both sides on one bar. Line the side of the cap and back should be the same length. Align the edge of the side and back of the cap. Connect them to the bars without nakida. Hook spend immediately in both parts of the cap. Should be a seam in the form of braids. The seam on the cap should go on the outside. The thread is not cut. Provarite fold beanie columns without nakida and perform a second stitch in the manner described above. The thread should be at the bottom of the cap. Get the base hats. You can leave the cap as is, tied with a drawstring. But that cap turned out elegant and beautiful need to decorate. The seam of the braid for decoration provarite openwork lace. So lace was a beautiful shape, the edge can be tie Pico or "crayfish" step. The cap according to your wish you can decorate with ribbons, bows, embroidery. To give the cap a beautiful shape, it can be tied columns with nakida in a circle, pulling the thread a little or promazyvaya together every 4th and 5th column. To make drawstring, dial from the edge of the bonnet air loops chain the desired length. Tie one row of polostevichi – tie ready. In the same way the second link. The knots on the drawstring tighten, thread, cut and fill. Cap amperite iron. The product is ready. 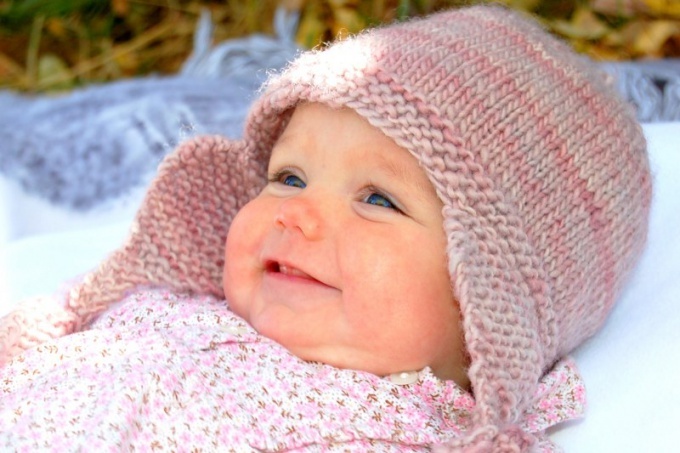 To tie a winter hat for a newborn can even a beginner knitter – just choose a beautiful warm wool yarn, simple model and to make correct calculations. Working on a thing of such small size will not take much time and material you will need a small amount. In case of failure, the product can quickly dissolve and remake. To protect baby from wind and frost, double cap of the inner and outer parts. 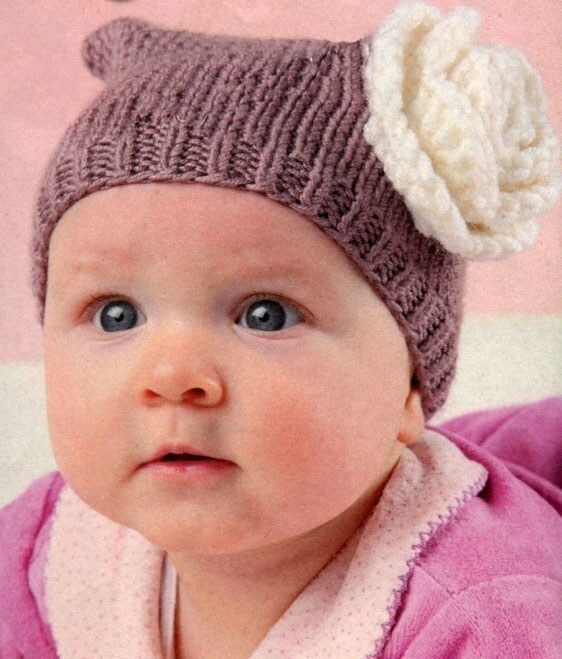 Try to associate a comfortable hat for a newborn: with headband elastics, round shape, with ears and ties. Start with calculation of the line of the bezel: remove the measure head circumference of the baby above the line of his eyebrows and the convex part of the head. Add 1 cm to freedom fit – do not forget that the product is a thick, double. As a sample use of finished knitted cap "on the head" of a child in the process, it will help you to make the necessary fittings. Tie knitting pattern and calculate its density. So you figure out the required number of loops that need to gain. Dialed loop distribute on 4 stocking knitting needles and make circular rows of gum 1x1 (always alternate one front with one back loop). You should have about 6-8 cm stretchy fabrics (this is the future hem double strap bottom). Keep working on baby caps selected textured or multi-coloured pattern, or just do socks and binding (in each circular row vymazyvaja only facial loops). At the end of the rubber bands go on the spokes of larger size (e.g. from №2.5 №3,5). Measure nebazhannya a hat on the baby or the cap-a pattern to adjust the height of the product. To the top of the cap gently rounded (not going large assemblies), at a distance of about 8 cm from the top of the head start a gradual subtraction loops. To cut the cloth for one loop, you'll need to purl together the two adjacent filament loop. Perform the subtraction at equal intervals in every second circular row of cutting at one time no more than 8 loops. When davaite cap to the desired height, close the remaining loop and tighten them firmly with a thread. Cut off the tail drag with a hook on the underside of the product. Before you – the top part of the winter beanie for the newborn. Remove the external detail of the product inside-out and proceed to perform an internal cap. For convenience, it is recommended to switch to straight needles, and then perform the connecting knitted stitch. Enter the loop from the wrong side of the external headgear on last row of strap-elastic. Yarn for domestic hats need to be more subtle than external. It is good to take the children's acrylic - flexible and pleasant to wear. The number of loops must be a couple less than when performing the front side of the double product. Tie the lower cap forward and reverse ranks of the front surface (in facial series – facial loops, purl – purl). As a sample, use the top portion. Finished in 2.5-3 cm from the top and carefully sew the open loops to the fabric exterior surfaces. Sew the finished cap of the lining. - follow-up front pull loop through removed. All you have to do the finishing touches, and children's knitted hat ready. Lanka fold the elastic in half, wrap it inside the unit and sew neat stitches with a thread of the same color. At the ends of the ears do the ties – they can be crochet from the air chain and one row of simple columns. And you can see crochet bunches of soft acrylic yarn and braid them into thin braids. Make the knots and trim the ends of thread. Pick up as lining for winter headgear flannel cap, and the baby will be warm and comfortable. Knitted beanie kids better to make a soft yarn, preferably without seams and unnecessary patterns. All of this can RUB the skin, and the hat will be uncomfortable. 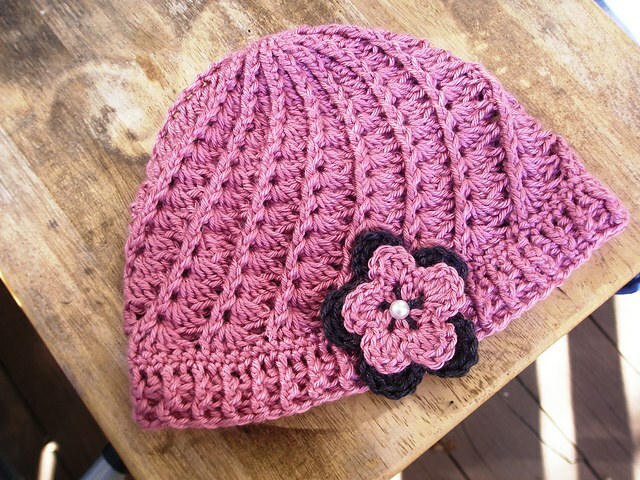 If you want to link the cap for girl, you can decorate it with ruffles, crochet. Sew them on top of the main canvas. For beanie baby will need quite a bit of thread. Dial in two spokes 74 loops and knit elastic band 1*1 6-8 rows. Following the gum series knit purl loops. To it then sew the ruffle - it will be more clear. Next, run 22 number of facial surface, then spread the loops on hosiery needles. Now knit circular rows, but the first of these again must be from the inside-out loops - there will also be a ruffle. In circular rows do subtraction. First promazyvaya together every 6th and 7th loop, then every 5-th and 6-th, 4-th and 5-th. Remove repeat in every second, until the spokes will not end up with 10 loops. The last loop pull the thread and tie a knot on the outside of the cap. On the edge of the canvas and draw a new loop, knit elastic band 1*1 about 3 cm From one end of the elastic arm loop for the button. To this end, the end of the row, close 2-3 loop, and in the next row again to dial them. A button can prepare from threads — it will be soft and will not irritate the child's neck. Take the hook, dial 3-5 loops and close them in a circle. Knit in a circle without additions of 5-8 rows. Try on the button to the loop size. Finished product pull the thread. If you don't want to mess with the button, prepare the ties. Dial crochet a chain of the stitches and knit one row of columns without nakida. The length of the chain, consider so that it will last for strings. Then, without breaking thread, start to wind the edge of the neck of crayfish step. On the other hand, the bands will continue the chain of air loops, and also tie her columns without nakida. To tie ruching for a hat, take the hook, dial a chain of air loops, or you can knit columns without nakida in the prepared purl rows. Then follow the pattern in the diagram. Cap for boy leave without the frills. The knack of knitting will allow a young mother to obtain a unique product that is right for her baby. For example, a hat with ears comfortable and warm ties, made of soft yarn from wool and acrylic. If you need a winter hat for baby, the yarn is recommended to be folded into two threads - the thing will turn out thicker. As the main pattern of the front select the front surface – it is possible to make a nice contrasting embroidery thread. Begin working from vyvazhivanija ears. For the first part, type 6 loop and tie the 3rd row is only purl loops. You get garter-knit – tight, fixed blade. Then you will gradually increase the size of the knitting to make the ear shape. In the fourth row do 3 purl stitches, then vivacite front crossed from the subsequent transverse thread (pulling) between loops; 3 loops to the reverse. Cross loop: enter from right to left needle under strand, grab the working thread (she's knitting) and pull a loop on the "person" canvas. Provarite fifth row garter viscous, it start to perform the first 3 loops of the sixth row. Then followed a new front crossed from the transverse threads; front loop and re-crossed. The number 3 will complete the reverse loop. Seventh row do garter viscous. Keep adding the front of the crossed loops every second (front) row until I am finishing a detail of the desired size. Put the work away, and from the individual coil bind fresh ear. You can now begin to implement the back part of the infant caps. 15 type of loops (for example) and enter into the work pent-ear. Now divide the pattern of knitted fabric into sections: the ear continue to do the garter viscous, and the back of the headdress, the so – called volumetric elastic. To obtain the gum, do the following sequence loops: in the first row – front, inside-out; the second obverse, and reverse is removed nepovezane. The working thread is in front of the knitting. Next (third row) the pattern repeats similarly to the first and second rows. When you propagate back hats for baby to a height of 2.5 cm, dial loop to run the front part. In the above example, it is sufficient 21. Knitting the cycle, and then circular knitting needles is done body rubber band. Before the caps make a height of 4.5 cm and a cross on the front surface. Tie a blade height of about 7.5 cm loop headgear should gradually be abated for the formation of the toe. Divide the knitting into 6 equal sections and start to purl together a couple of loops at the end of each of them. So the subtraction will be uniform. Davaite cap to the top until the last 10 -6 eyelets. Pull a thread, and then drag trimmed "tail" on the underside of the product. You only have to crochet on the ends of each lug tie chain loops and one row of simple columns without nakida.